Ensuring Reliable Process Cooling at Coppertail Brewing Co.
Understanding and emulating how an existing business achieved success is often one of the biggest advantages to new business start-ups. Dogfish Head Craft Brewery, one of the first large craft breweries in the United States, has become recognized as a leader in this burgeoning industry. New breweries look to Dogfish Head’s model for implementing ideas that work without experiencing the irksome (and often expensive) trial and error growing pains. DogFish Head Craft Brewery uses nearly 3,800 feet of pre-insulated plastic piping system from GF Piping Systems. Inhibited food-grade glycol runs through the entire system for cooling the beer and in the distillery production process. Established in 1995 in Rehoboth Beach, Delaware, by Sam and Mariah Calagione, the brewery’s success can be attributed to always searching for improvement in every area – from honing what they call their “off-centered” ales to new production techniques. Since its founding, Dogfish Head has grown rapidly with 14 expansions and now employs over 350 coworkers. Dogfish Head has proudly been focused on brewing beers with culinary ingredients outside the Reinheitsgebot since the day it opened as the smallest American craft brewery 23 years ago. It has grown into a top-20 craft brewery and has won numerous awards throughout the years including Wine Enthusiast’s 2015 Brewery of the Year and the James Beard Foundation Award for 2017 Outstanding Wine, Spirits, or Beer Professional. As with many manufacturing operations that require cold refrigeration, Dogfish Head quickly discovered that leaks and puddles are common byproducts of cooling systems. They hoped to change that in 2002 with a facility expansion and move to a 100,000-square-foot converted cannery in Milton, Delaware. At that time, the number of options for coolant piping was limited. First, they installed schedule 40 PVC for the main cooling lines. With the food-grade glycol running at 26 °F (-3 °C), the PVC cracked. Repairing pipe and worrying about system failures unfortunately became a normal routine. With the goal of eliminating these types of problems, Dogfish Head went through a series of pipe system changes in the cooling operation, which included trying a thicker schedule 80 PVC, then, threaded steel pipe, and finally, welded steel pipe. With each method they tried, some advantages were gained while other problems were created. The brewing crew found that threaded steel piping leaked, even though it was a much stronger alternative to PVC and that welded steel was cumbersome and expensive to install. There were also condensation problems with both types of steel piping that caused unsanitary mold growth. 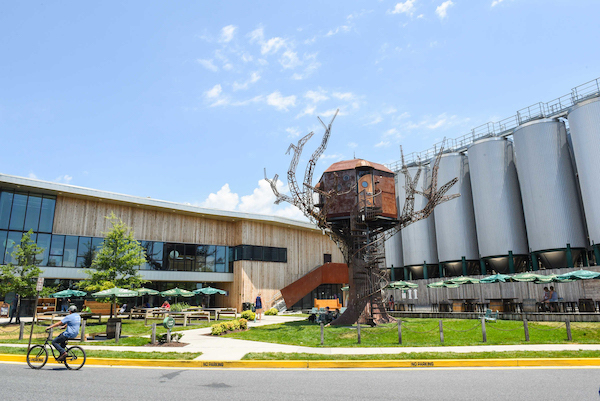 In 2006, Dogfish Head expanded again – this time with a retrofit of its old cold water tank for the 100-barrel (bbl) brewhouse. Management learned about a new type of system for secondary cooling – a pre-insulated plastic piping system called COOL-FIT® ABS Plus, from GF Piping Systems (GF). They decided to try the new system using a small 2-inch (d63) diameter size. After receiving manufacturer training, the brewery’s own maintenance crew installed most of the system. Installation went smoothly and quickly. The significant installation time saved in labor allowed the new lines to start up more quickly than anticipated. “We had good cold water to supply wort cooling in the 100-bbl brewhouse. We made COOL-FIT our standard and began using it throughout the brewery,” said Brian Hollinger, Vice President of Operations. Benefits from the system installation were dramatic. Condensation problems were instantly gone with improved sanitary conditions visually apparent. This new cleanliness, devoid of drips, was also evidence of improved thermal efficiency. Hollinger said pre-insulated plastic piping became the engineering standard for Dogfish Head due to its efficiency, durability and lower maintenance on insulation. M. Davis & Sons, Inc., a Delaware-based contractor, has been involved with many of the brewery’s installations over the last 10-12 years, well before the craft brewery craze even started. In 2002, when Dogfish Head moved to the remodeled cannery in Milton, M. Davis was brought in to make the piping interconnections on the original bottling lines and tanks using stainless steel tubing to all their different equipment and tanks, and get the system up and running. With their previous experience installing carbon steel and other types of metal systems, M. Davis appreciates the ease of working with the system. COOL-FIT is easily joined using cement and a flat brush. Pictured is Mike Sharp, Leadman for M. Davis & Sons, Inc., the Delaware-based contractor most heavily involved with the COOL-FIT installation at Dogfish Head. The most recent COOL-FIT installation at Dogfish Head was the Bay 7 Loop Project in the summer of 2017 where M. Davis was responsible for the entire project. Using empty warehouse space, the expansion project involved adding a 1,000-foot loop of the piping to create a supply line to 16 new 60-foot high tanks. Starting at the pumps, they created a new feed and supply and return line from the pumps out to the 16 tanks. To check for leaks after installation, the piping system is filled with water and then pressurized. By walking along the pipe any leaks or drips are quickly identified. A gap in the piping at each joint allows easy access for quick rebuilding. Shown is one of 16 new 60-foot tanks in the Bay 7 Loop Project. The expansion included a run of 1,000 feet of COOL-FIT piping to convey chilled water to keep the beer tanks cold. Since the first installation in 2006, pre-insulated plastic piping has been used exclusively for every Dogfish Head glycol expansion culminating in nearly 3,800 feet of pipe in virtually every cooling area of the facility. 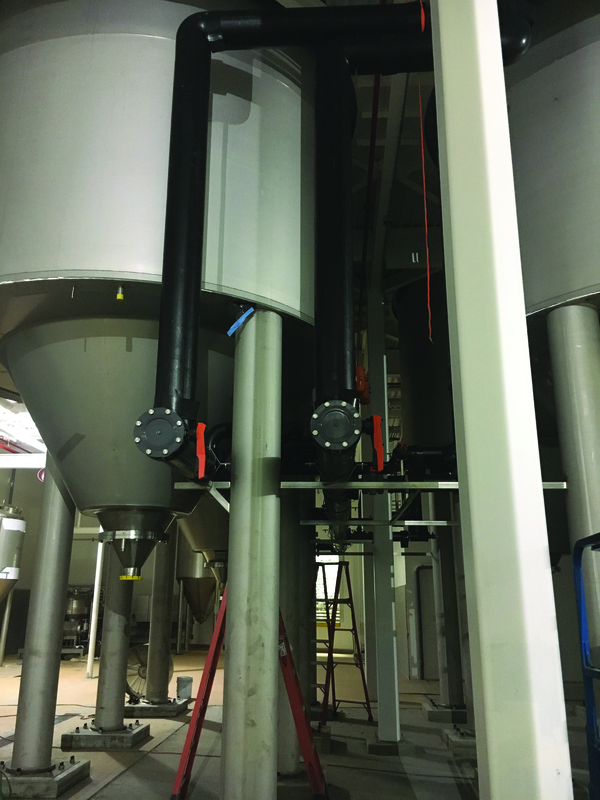 Brewhouse 2 and Brewhouse 1 incorporate knockout exchangers using large COOL-FIT size D160 pipe for the 300-foot header. Smaller D90 size pipe runs of about 100 feet are used for cooling in Brewhouse 2, then drop to even smaller D63 size in Brewhouse 1 with another 150 feet of pipe. Dogfish Head’s success with COOL-FIT for secondary cooling has become a catalyst for its fast-growing popularity in the craft beer industry. Food and beverage industries around the globe depend heavily on proper temperature control and can benefit from lessons learned at Dogfish Head. Dogfish Head and Craft Brewery is 350-plus coworker company based in Delaware with Dogfish Head Brewings & Eats, an off-centered brewpub and distillery; Chesapeake & Maine, a geographically enamored seafood restaurant; Dogfish Inn, a beer-themed inn on the harbor; and Dogfish Head Craft Brewery, a production brewery and distillery featuring a tasting room and food truck. Dogfish Head supports the Independent Craft Brewing Seal, the definitive icon for American craft breweries to identify themselves to be independently owned and carries the torch of transparency, brewing innovation and the freedom of choice originally forged by brewing community pioneers. Dogfish Head currently sells beer in 44 states and Washington D.C. and will expand into additional states in 2019. For more information, visit www.dogfish.com. About M. Davis & Sons, Inc.
M. Davis is a fifth generation industrial construction company leading the way as a new breed of industrial providers for global corporations, regional leaders and government agencies. With a focus on safety and quality workmanship, our complete construction, fabrication and maintenance capabilities produce customized, turnkey solutions for mechanical, electrical and control systems. We specialize in complex, unusual projects that require out-of-the-box thinking and ambitious solutions not found elsewhere. For more information, visit www.mdavisinc.com. GF Piping Systems is a leading supplier of piping systems and instrumentation for the safe and reliable transport of liquids for industrial process control. Its thermoplastic systems feature non-corroding, energy-efficient, maintenance-free performance. Industries like food and beverage, cold storage, semiconductor, pharmaceutical, chemical processing and many others have found thermoplastics to be an excellent alternative to the frequent replacement costs of metal including stainless steel piping, which corrode and scale over time, and are unwieldy in overhead and rooftop installations. For more information visit www.gfps.com. Angela Sampaio is a Market Segment Manager, Cooling (Eastern Region) with GF Piping Systems. To read similar Beverage Industry Cooling articles, visit www.coolingbestpractices.com/industries/beverage.